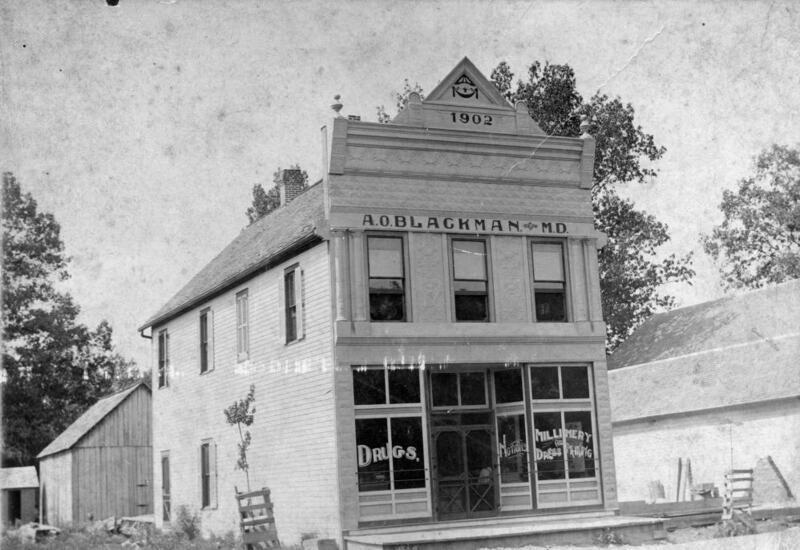 The man whose name appears at the head of this article is one of the older, but very much alive, merchants of Allenville. He was born May 24, 1846, in Cape Girardeau County, the son of B. H. and Elizabeth (Cox) Groves. His education was begun in the public schools and completed in the Jackson Academy. Farming and teaching school first occupied the time of the subject of this sketch, but in 1864 he became a benedict, and settled down to farm on his own account, still continuing to teach school. 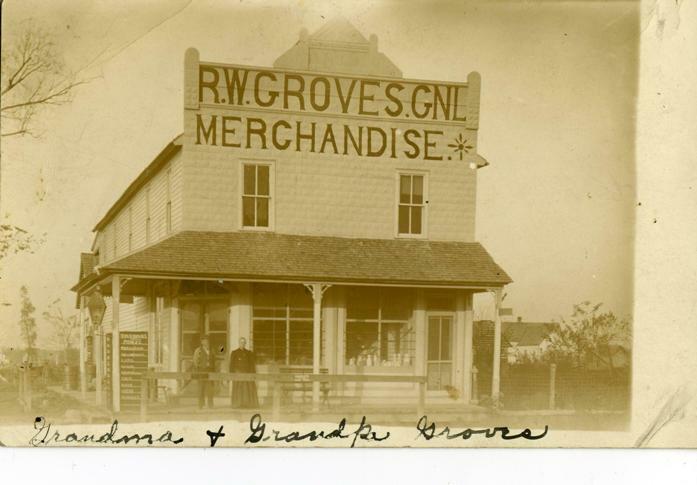 During the first year of married life, Mrs. Groves died, and he contracted a second marriage and remained on the farm until twelve years ago, when he retired and bought property in Allenville, including the present business. He is still very active, and can sell as many goods as others much younger. He first married Martha A. Kinder and, after her death, Martha J. Renfroe. They have seven children, four sons and three daughters. They are: Walther R., M. O., W. H., Andrew W., Emma, Martha and Mabel. Mr. Groves adheres to the principles of the Democratic party, and does that from conviction, not merely because it happened so. He is also a Baptist for the same reason. He is well read and a scholar, and personally a congenial, jolly sort of man, whose greeting at all times carries with it a note of humanity and brotherly feeling so seldom found in these times when egotism and selfishness are dominant everywhere. Being a school teacher and as such specially interested in better schools, he served on the school board many years, and still takes a keen interest in all educational problems and advantages. M A Nichols is the former M A Courtway, my great, great, great grandmother. Letter courtesy of Teresa Mathis - Thanks you! 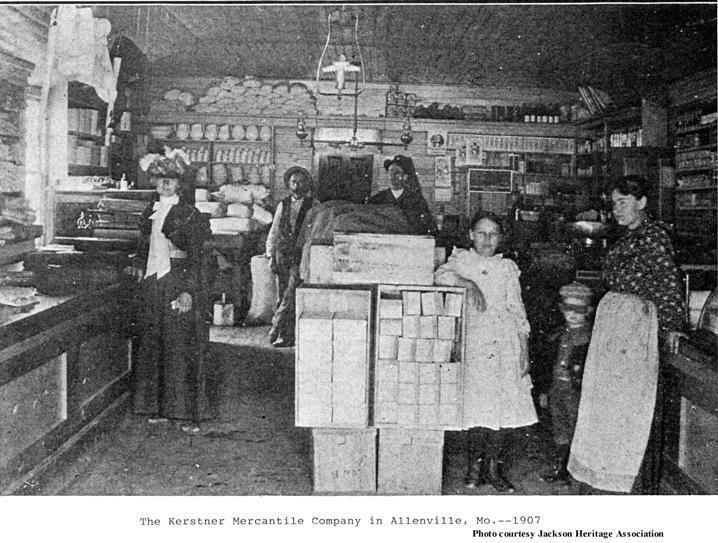 Above is some Allenville Missouri advertising from the 1870's. 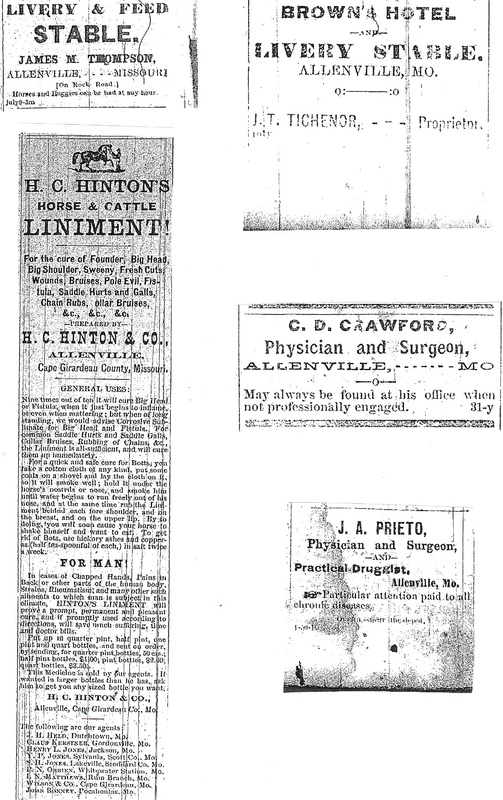 These ads were found in the Missouri Cash Book newspaper of Jackson Missouri. 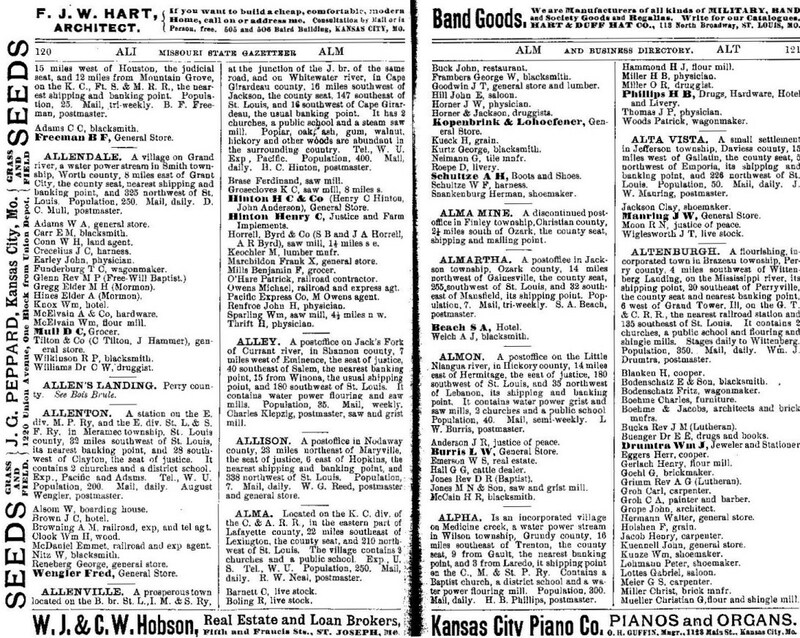 Along with the ads above I found the names of these businesses also from the 1870's: Wm. Burgess & Co. storehouse, Franklin & Co. Storehouse, Kimmel Groceries, Billy Lewis Livery Stable, Dr. Emon's Drug Store, Mr. R. Masterson's Saloon, T.E. 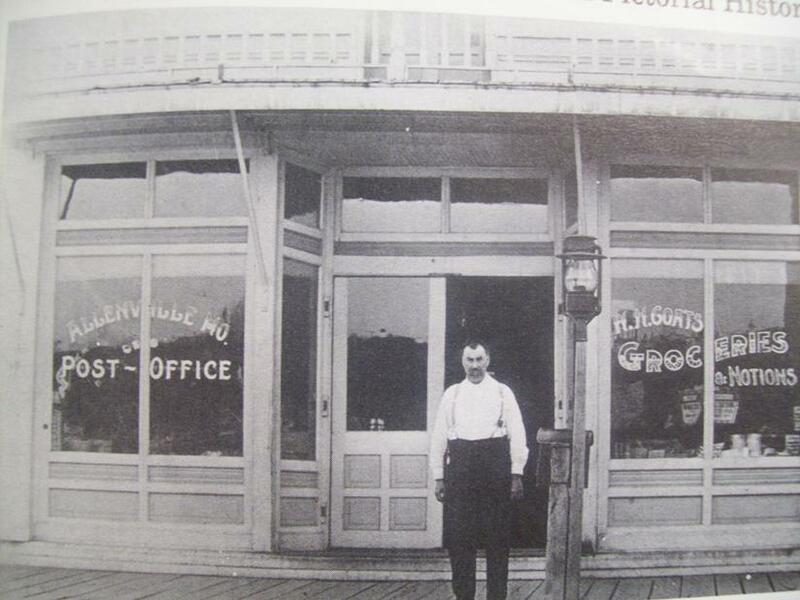 Ross's Saloon, and Dr. Prieto's Ice Cream Saloon that was located at the old stand of Renfroe & Grahm and opened June 10th 1872.